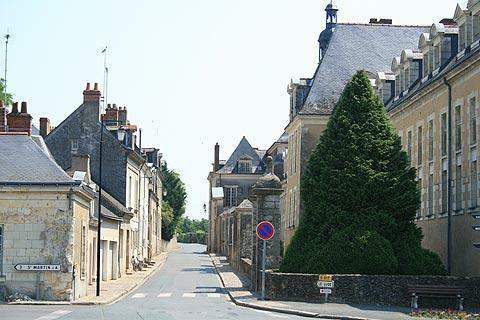 Bauge is a small town east of Angers in the Maine-et-Loire department of the Pays-de-la-Loire region - it is also part of the historical Anjou region. 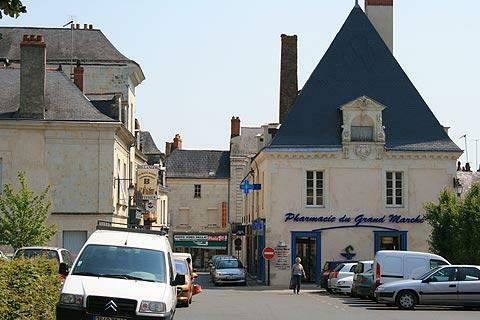 France This Way comment: when you arrive in Baugé the parking is right next to the château, which I find a little disappointing since part of the pleasure of 'discovering' a town is lost when you arrive immediately at the main highlight. On the plus side, you don't need to walk very far! The tourist office of Baugé is in a beautiful salon inside the 15th century castle. Ask for the leaflets giving a guided walk round the town ("Parcours découvert au cœur de la ville") as these are full of details of small things you might otherwise not see. Baugé castle was the favourite castle of Duke Rene of Anjou and was home to his fabulous Apocalypse tapestry. The tapestry has now been moved to the Château d’Angers. Inside the castle you can watch a video of the life of René of Anjou. 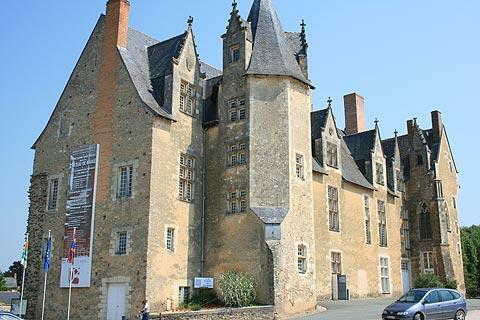 The Baugé Museum of Art and History is also in the castle and contains a wide range of items explaining the history of the town and the way of life of the residents. 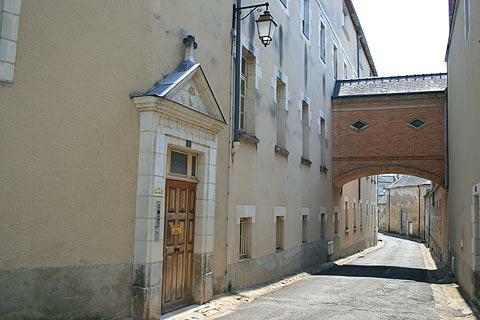 From here you can continue to the Rue de la Girouardiere, one of the oldest streets in the town and which leads to the Chapel de la Girouardiere and the Cross of Anjou. This cross is said to be made from the cross on which Christ died (the wood is Palestinian though its authenticity has not been proven). The cross was given to the monks of Baugé following a thirteenth century crusade to the Holy Land and was later richly decorated with precious stones and gold: it is the symbol of Lorraine. 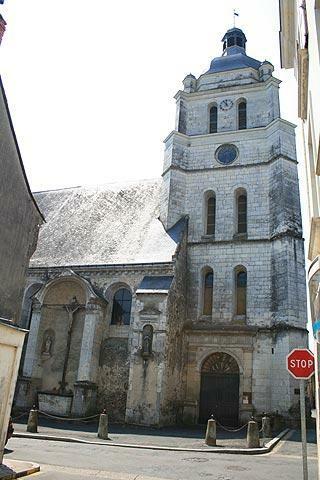 The other main site in Bauge is the ancient apothecary of the Hotel-Dieu - a medieval hospital. This 17th century apothecary has been classed a historic monument and is considered to be one of the most attractive in France with more than 600 medical articles and bottles. Also in the Hotel-Dieu you can see the room where the sick were treated and a baroque style chapel. 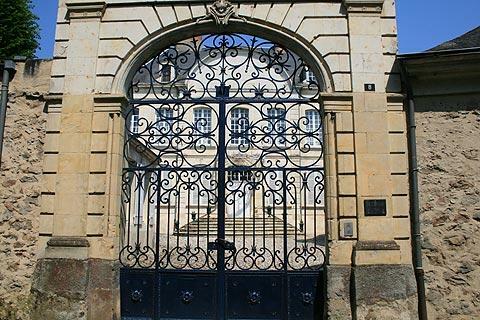 Elsewhere in Baugé you can see an attractive section of the Couesnon river and a medieval house in colombage, and the classical style facade of the original Palais de Justice as well as numerous townhouses built in the 16th - 18th centuries: individually these are not important but together create a pleasant impression. Families might enjoy a day at Holly Park, a theme park in the grounds of a XVIII château. This can be found at Echemire, four kilometres from Bauge. In the villages around Baugé there are eight unusual churches with twisted steeples: no one seems to know why or how they got this unusual design, and whether it is intentional or accidental. The most popular villages with visitors include Cheviré le Rouge (to the north-west) and Vieil Bauge (to the south-west). Other local highlights include the Logis Seigneurial at Clefs (north of Baugé), a 16th century townhouse most noted for its monumental fireplaces. 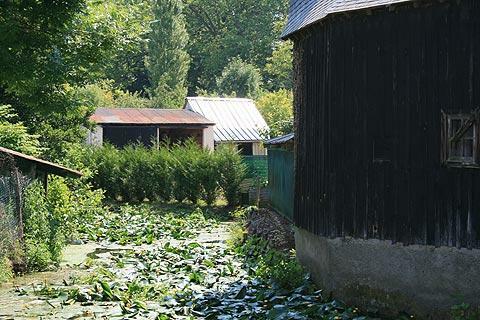 Gardeners will enjoy the gardens and botanic parks around the castle at Chigné, east of the town, and Gastines castle at Fougeré. Most of the main attractions in the Loire Valley are to the south of Baugé, although the imposing Chateau du Lude is only about 25 kilometres north-east of here.